Sarah Pesek, M.D., has joined St. Peter’s Breast Surgery in Albany, New York, a practice of St. Peter’s Health Partners Medical Associates. Board-certified in general surgery, Dr. Pesek will practice breast surgery. Dr. Pesek previously served as a surgeon with Memorial Hospital of Rhode Island in Pawtucket. Her professional interests include psychosocial and survivorship issues in breast cancer. Dr. Pesek received her medical degree from the Penn State College of Medicine in Hershey, Pennsylvania. She completed a residency in general surgery at the University of Vermont Medical Center in Burlington, Vermont. 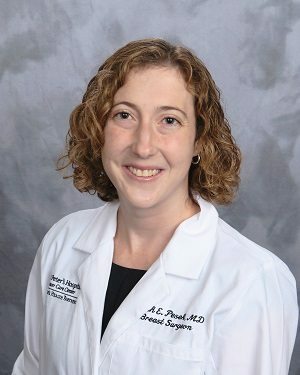 Her fellowship training in breast surgery was completed at Care New England’s Women & Infants Hospital in Providence, Rhode Island. St. Peter’s Breast Surgery is accepting new patients at 319 South Manning Blvd., Suite 210, in Albany. For more information or to make an appointment with Dr. Pesek, please call 518-641-6936.